Occasionally a tabletop, dresser, or nightstand might get a blemish such as a burn or watermark. New Life Furniture can expertly repair and refinish the area and save the piece of furniture. Poorly working and binding drawers only get worse and should be corrected to keep the furniture piece working properly. There are many, many different drawer track styles and New Life Furniture can correctly repair worn drawer tracks, guides, and drawer bottoms. Some dressers and cabinets become loose and have movement between their joints. Looseness leads to bad drawer alignment or bad door alignment which will prematurely wear moving parts. A rigid square case will make a noticeable difference in the functionality of the furniture and add years to its life span. Chairs with broken arms or legs can be repaired. Broken drawers are not a problem. A fatigued or broken spring can be repaired to return the chair or sofa back to the comfort level it once held. Sagging or broken springs put undue stress on the upholstery and will eventually damage the piece to the point of needing a complete reupholstery job. New Life Furniture can replace a worn or damaged zipper, open seam on a cushion, or button that has come off. We can correct many upholstery issues that have been bothering you. Arms becoming loose is a very common problem with furniture. New Life Furniture has 20 years of experience and has made thousands of repairs. Everyday household furniture pieces get a lot more use than one can imagine. Loose hinges, stripped screws, bad door alignment, and faulty latches can escalate into more major problems if left unrepaired. Our advice is to tend to small problems before they become bigger ones. The hardware on a piece of furniture can be very unique and really make the piece. Dark and tarnished hardware tends to just blend in and doesn’t give the furniture any “pop” or “personality.” New Life Furniture offers hardware polishing and lacquering services. Keep your home or business looking great with furniture repair from New Life Furniture Systems in Wilmington, Delaware. We have the experience and expertise to improve your interior. We provide prompt and professional furniture touch-ups and repairs. Our New Life Furniture Systems craftsmen provide unparalleled customer service and dependability. We can repair and refinish any project from modern touch-ups to antique furniture repair our craftsmen have seen and done it all. No broken chair or piece of furniture is a lost cause — bring it to us first. We are dedicated to providing our customers with the highest quality of service and workmanship, and we are insured for your protection. As a chair loosens up with time, it creates overly stressed points where the components are connected, which could lead to breaks. It is important to keep a chair completely tight as a unit to keep the stressed points non-existent. 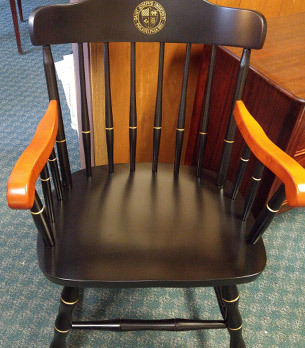 When a chair does have a break, New Life Furniture can repair or recreate the broken part to save the chair.